Kansas Gov. Sam Brownback Nominated By Trump To Lead Religious Freedom Office Brownback, a staunch social conservative, was one of the least popular governors in the country after tax cuts he championed failed to ignite the state's economy and led to deep spending cuts. Kansas Gov. Sam Brownback speaks to the state legislature in 2016. President Trump has nominated Brownback for a State Department post. "Religious freedom is the first freedom. The choice of what you do with your own soul. I am honored to serve such an important cause," Brownback said in a tweet as news of the nomination was breaking. The Senate must act on the nomination before Brownback can start his new position. Brownback's unpopularity is largely due to deep income tax cuts that he championed. 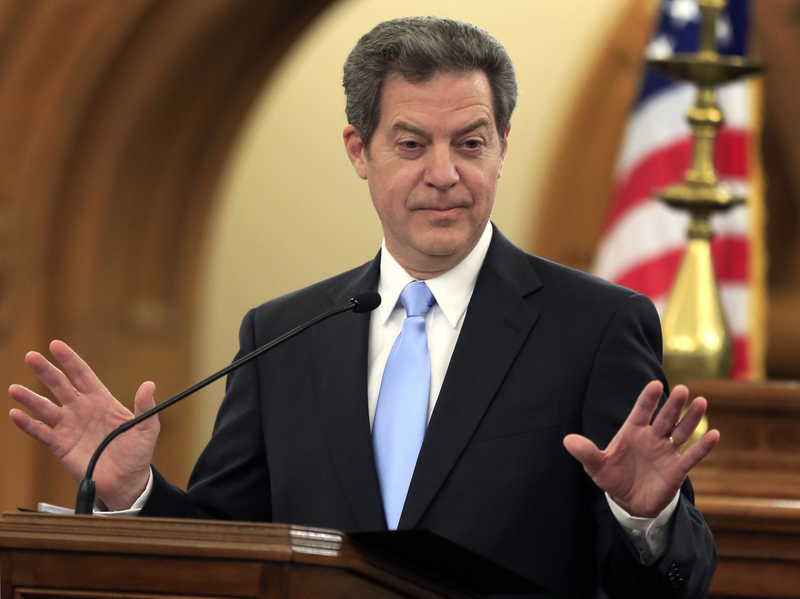 At the time of their passage in 2012, Brownback said the tax cuts would deliver a "shot of adrenaline" to the Kansas economy and make it a "red state model" for the nation. Instead of igniting the Kansas economy as Brownback had, promised, the cuts sent state revenues plummeting and prompted lawmakers to make sharp spending cuts and raise taxes. Earlier this year, Kansas lawmakers, led by a coalition of newly elected Democrats and moderate Republicans, dealt a significant blow to Brownback's political reputation by overriding his veto of a bill that reversed the tax cuts. Brownback, the state's 46th governor, has about 18 months remaining in his second term. Should he step down, Lt. Gov. Jeff Colyer, a physician and former state senator from Overland Park, would become governor. "Sam Brownback will be remembered for becoming the most unpopular governor in America," Senate Democratic Leader Anthony Hensley, of Topeka, said in a statement on Twitter. "His tax experiment failed to grow the economy as he promised. Instead, his policies have bankrupted our state." Others hold him in higher esteem. "He inspires other people," said Kathy Ostrowski, legislative director for Kansans for Life, the state's largest anti-abortion organization. "He's inspired some conservative leaders who had terrible bruises from the last couple of decades. He said 'hang in there, stay with it. Let's keep working.'" Prior to his election as governor in 2010, Brownback served 14 years in the U.S. Senate. Near the end of his one and only term in the U.S. House, Brownback was appointed to fill the seat of U.S. Sen. Bob Dole, who resigned to run for president. Kansans elected him to a full Senate term in 1998 and re-elected him in 2004. Brownback had also been the favorite of many social conservatives when he joined a crowded field of Republican presidential hopefuls in 2008. Many believed that he ran for governor to burnish his reputation as a fiscal conservative in preparation for another bid for the White House. Those aspirations faded with the failure of his economic policies, said Patrick Miller, a University of Kansas political scientist. "Certainly, we can look at the totality of his career and see some successes and some failures," Miller said. "But this (the failure of the tax cuts) will be the policy that writes his Wikipedia page in a decade or so." Stephen Koranda, statehouse reporter for Kansas Public Radio, and KCUR reporter Sam Zeff contributed to this report.